Earn $4.04 in Rewards credit (404 points) What's This? For the Dura-Ace 9000 and Ultegra 6800 series, Shimano wanted to create a shift cable set that would provide the smoothest, easiest, and best shifting possible. To accomplish this they have brought together super slippery polymer coated, stainless steel cables, housing pre-lubricated with silicone grease, and sealed end caps to keep out the grime. This all results in a system which minimizes friction, making for best shifting possible. Available in various colors and provides shift cable and housing for one bicycle. Note: Shimano ONLY approves the polymer coated cables for use with 9000 and 6800 series plus newer derailleurs with stronger cable fixing bolts. I bought these cables for use on my Ultegra 6500 group. Bike shifts effortlessly now. 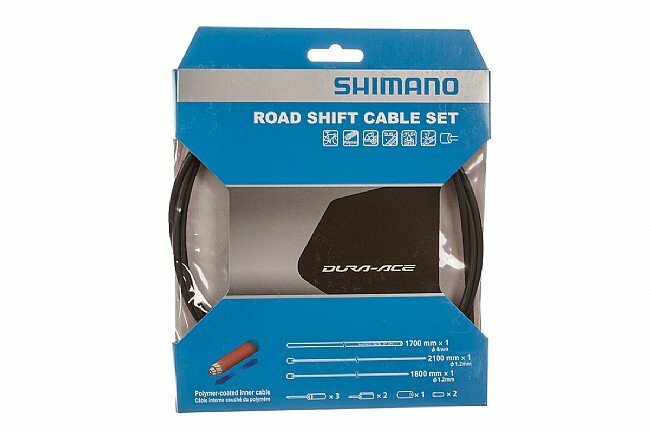 This is a reliable, well made set of shifter cables and housing that works with either SRAM or Shimano systems. You'll have to pre-stretch the cables a bit before locking down your pinch bolts permanently, but once that's done, you're shifting will be precise. Replaced the original 105 brifters with new versions that route cables on the handlebars. Shifting was basically OK but not what i expected from new equipment. Replaced the cables and housings with this package. Huge improvement. By bike came set up with Jagwire. Didnt last very long. Inner cable started to come apart. Going back to Shimsno. What a difference these cables made in shifting performance. Easy to install and a good price. I have a set on my other bike thats been on for almost 2 years with a lot of miles and still shifting good. Works the best, last a long time, and the price is right. they do what there supposed to do very well. installed as normal and they work like a charm. This is a very slick shift cable to use. Installation is easy and the cable is a very smooth and slippery in the cable housing. I did not install this in the 9000 or 6800 (installed on 7900). I was very careful and scraped the coating off the cable where it is clamped in with the fixing bolt, paranoid of cable clamp slippage. Not cheap, but a very smooth and slick cable. A fine shift cable set for a road bike, IMO.